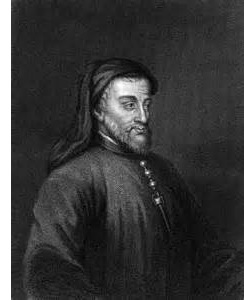 Geoffrey Chaucer (ca. 1340-1400) - English poet, often called the "Father of English literature" because he was the first great story writer in England's history (he preceded Shakespeare by two centuries). Considered the greatest English poet of the Middle Ages, he was mostly responsible for elevating the English language to the level of Latin and French, which were considered more sophisticated at the time (much in the way that Cicero elevated Latin 1500 earlier). The English spoken at the time is known as Middle English. The personal details of Chaucer's life are not well-documented, and what is known is not all that interesting. He was born in London to a wealthy family (or at least well-to-do family) of vintners. The dates of his birth and death are uncertain, and only approximations. It is known that he fought in the Hundred Years' War for King Edward III. We know this because in 1360 he was captured by the French at the Siege of Rheims, and Edward paid £16 for his release, which was considered a large sum. He began writing after his military career ended. His most famous work is The Canterbury Tales which consists of 20 stories, both poetry and prose. About a century and a half after his death he was interred in Westminster Abbey, the first in what would become a long list of writers buried there. They reside in the South Transept which is known today as Poets' Corner.